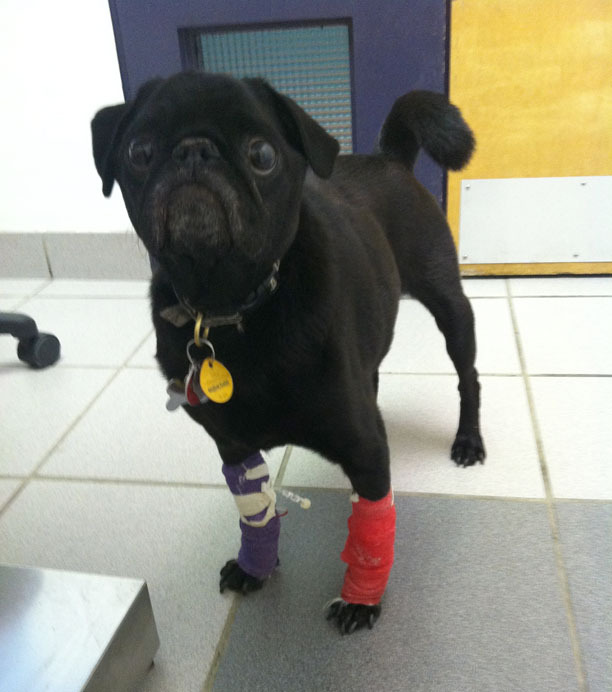 This is the story of a little pup named Hamilton Pug. 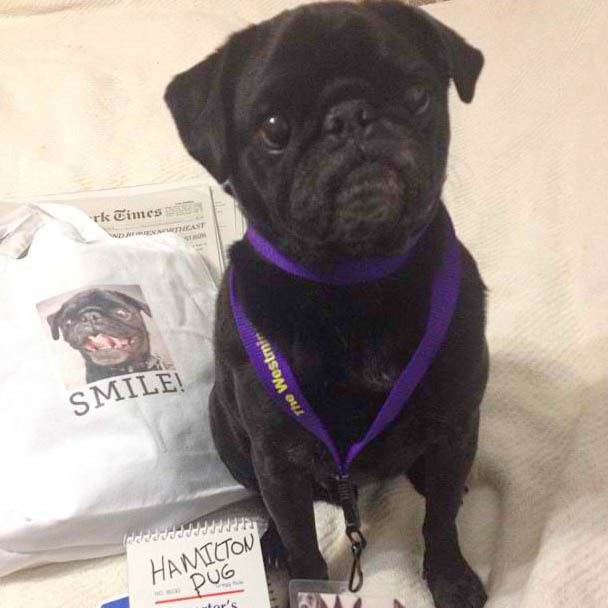 When you think of Hamilton Pug, you picture a dog living a life of glamour – the late-night parties, endless filet mignon, and hanging with celebrities in New York City. 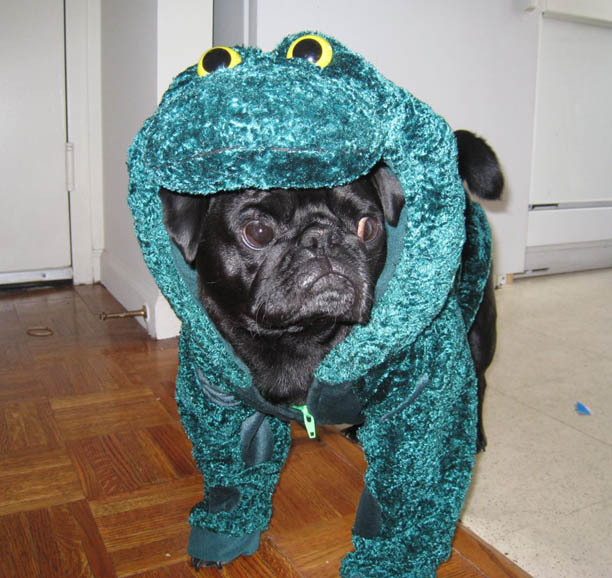 However, Hamilton Pug was not always the well-manicured pup that the world knows today. In fact, his life got off to a rocky start. Just a puppy, Rocco, as he was called in the shelter, was found wandering the streets of Columbus, Ohio with much of his fur missing. 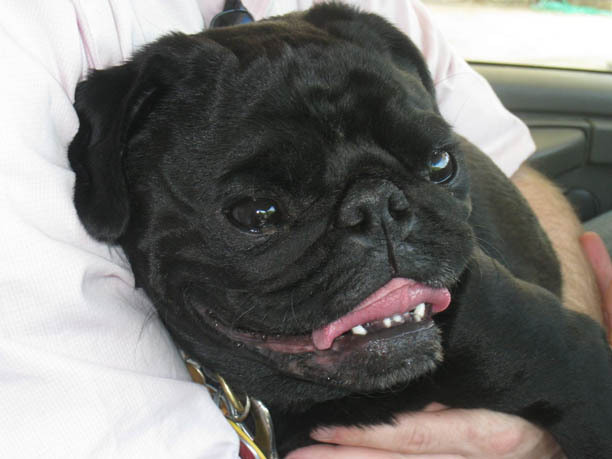 After being in the local shelter for several days, Ohio Pug Rescue scooped his smooshy-face up and put him into a wonderful foster home. 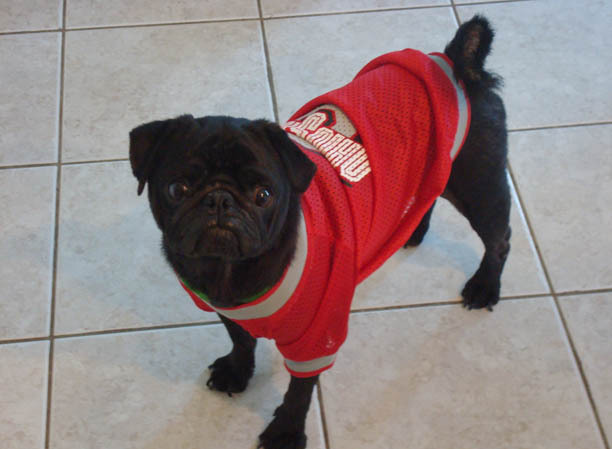 His foster mom thought he might be embarrassed of his skin condition, so she purchased an Ohio State University jersey for a self-esteem boost. As soon as his fur started to grow back, he learned how to remove the jersey. 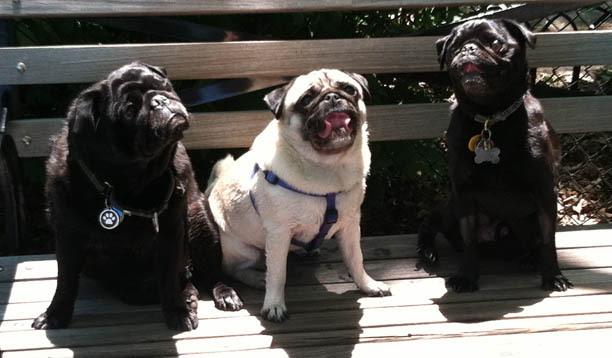 Rocco settled in quickly to his new home, which included two other dogs, Molly & Milo. 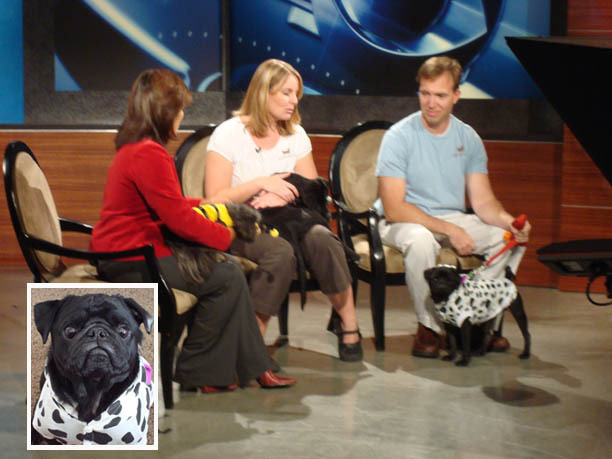 He got a taste of stardom when he was on a local morning show. He’s always been a natural. In December 2008, Rocco’s life changed forever. He was driven to Mutts & Co. to pick out a new human. Rocco locked eyes with a young man and neither has been the same since. The next day his foster mom drove him to his new home in Toledo. There, he got a new name, Hamilton, and he spent the first night sleeping on top of his new dad. Four months later, they were in a U-haul headed to New York City. Hamilton acclimated quickly to big city life, even though he refused to pee for the first 24 hours (“What happened to my green grass?” he said.) 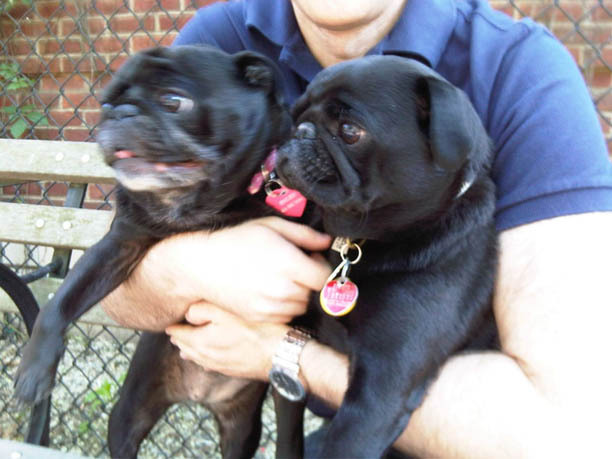 Ever the social butterfly, Ham met another black pug, Smush Maxwell, at the dog run on his very first day in the city. Days were filled with trips to Shake Shack, begging for hot dogs at food carts and standing guard at Magnolia Bakery. 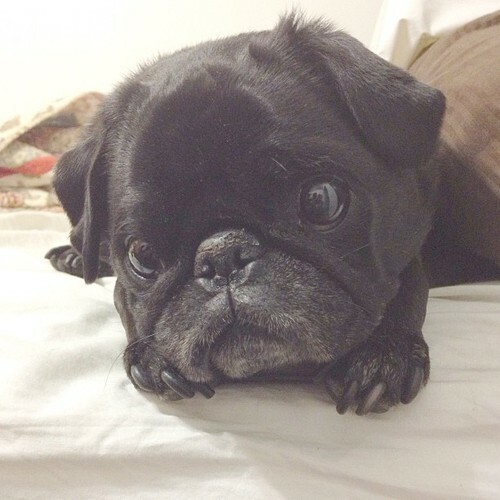 The pug life was good. On February 20, 2012, Hamilton suddenly got very ill. His belly was bruised and swollen, and he was bleeding internally. Batteries of tests suggested he had an autoimmune disease and was given a 50/50 chance of surviving the week. In high spirits, Ham just cared about his next serving of wet food, which is why even now, he runs to the vet. After months of recovery, lots of medication, and one frightening setback, Hamilton is as healthy and snuggly as ever and living life the fullest. Healthy for over a year now, Hamilton spends his days lounging, dressing up, playing at the dog park and waiting for his food machine to go off. 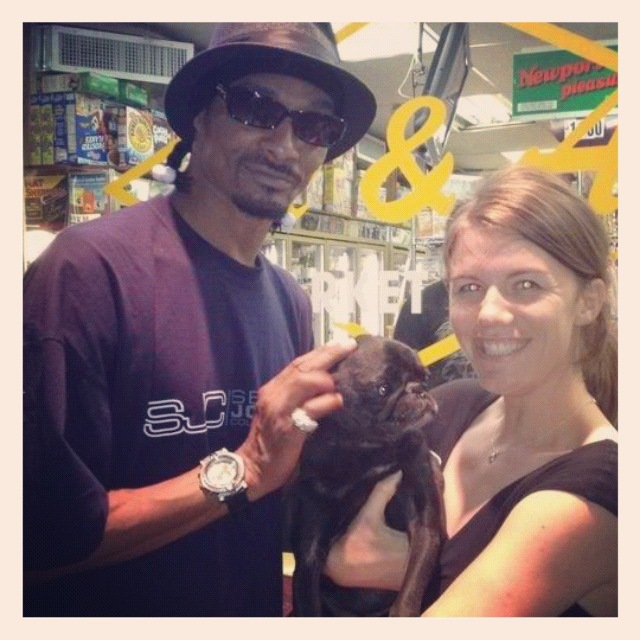 Sometimes he hangs out with Snoop Dogg. 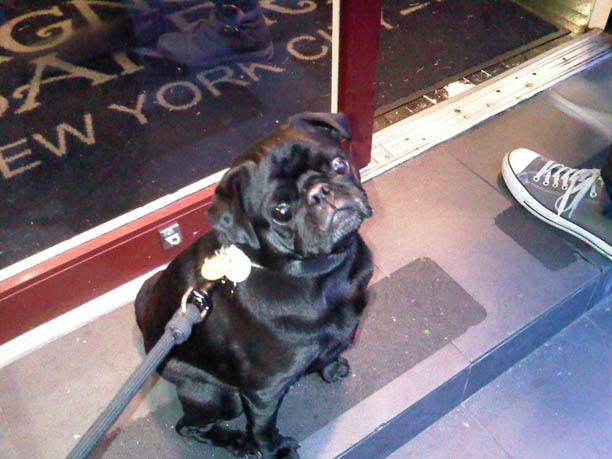 He likes to visit famous New York City landmarks and let everyone bask in his beauty. And the Subway too. While walking home from the park one day late last summer, Hamilton decided he wanted to get his social media empire off the ground to show the world his cute face. With the help of his mom and dad, he set up accounts on Instagram, Twitter, Facebook, Tumblr, Vine, and BuzzFeed. He even got a chance to be a guest contributor for the New York Times’ Westminster Dog Show Coverage, stealing the show from Banana Joe. CEO Hamilton Pug was born. Hamilton is enjoying his slice of celebrity, but at the end of the day, all he wants is a lap and a steak (or chicken, lamb, peanut butter, or BACON). This article is by BarkPost contributor, Wendy Frink. 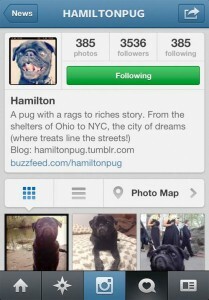 Find her on Twitter and make sure to follow the fabulous adventures of her pup, Hamilton Pug!